In our ongoing discussion of Hindu temples destroyed by the Mughal invaders in India, today we consider the events that took place in 1661 A.D., when the Mughals advanced their campaign into Kuch Bihar, north of Bengal. Muslim apologists like scholar Richard Eaton, whose writings have been quoted in previous segments of this series, point to Kuch Bihar as an example of the Mughal rulers' compassion for local Hindus. But as we see from their own historical records, the Mughals actually destroyed many temples in the region. 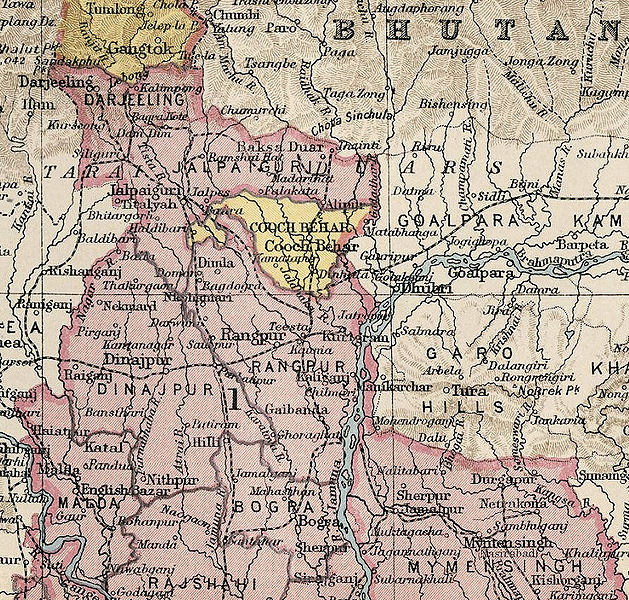 Kuch Bihar was a small kingdom situated to the south of Bhutan, west of the Ahom Kingdom in the upper Brahmaputra valley, and the northeast of Bengal and the Ganges plain. In 1586 A.D., upon the death of their ruler, Nara Narayan, the Kamata kingdom split, leaving Kuch Bihar independent in the west. This split occurred at the same time Emperor Akbar were aggressively expanding his power, and Kuch Bihar soon became a vassal state of the Mughal Empire. According to historical records of the day, the Mughals were hell-bent on destroying Kuch Bihar's main temple deities, whose abode was patronized by the local Bihari royals. The royal murti residing in the Kuch Bihar temple was an idol of the Raja, Bhim (Bir) Narayana. It was this idol that the Mughals wanted to destroy, in order to further debase the trust and loyalty local residents had for their now defeated rulers. While the temple deities were a primary target, the invaders were said to be strictly under orders not to attack and destroy the property of local citizens. The Chief Judge of the Mughals in Bengal, Saiyid Muhammad Sadiq, was responsible for handing down Sharia law. He issued an order prohibiting the Mughal soldiers from touching the property of local Bengalis. Anyone caught disobeying these orders was to have their hands, ears or noses cut off. This order by Justice Muhammad Sadiq is often pointed to as proof that the Mughals were not cruel invaders, but were really the protectors of local citizens, who they wanted to have continue producing food and goods to support their newly captured territory. Aside from the degree that this was true, and the Bengali people were spared personal attack, evidence from the Mughals' own historical narratives indicates the destruction not only of a single royal murti in a Kuch Bihar temple, but the destruction of many temples throughout the region. "In 1661 Aurangzeb in his zeal to uphold the law of Islam sent orders to his viceroy in Bihar, Daud Khan, to conquer Palamau. In the military operations that followed many temples were destroyed..."
" ...Towards the end of the same year when Mir Jumla made a war on the Raja of Kuch Bihar, the Mughals destroyed many temples during the course of their operations. Idols were broken and some temples were converted into mosques." "By looting the temples of the South and hunting out buried treasures, Mir Jumla amassed a vast fortune. The huge Hindu idols of copper were brought away in large numbers to be melted and cast into cannon." "Mir Jumla made his way into Kuch Bihar by an obscure and neglected highway. .... In six days the Mughal Army reached the capital (19th December) which had been deserted by the Rajah and his people in terror. The name of the town was changed to Alamgirnagar; the Muslim call to prayer, so long forbidden in the city, was chanted from the lofty roof of the palace, and a mosque was built by demolishing the principle temple." When Kuch Bihar's ruler, Nara Narayan died in 1586 A.D., his son Lakshmi Narayan took power, and it was under his rule that the Mughals first moved into the territory around north Bengal. Lakshmi Narayan lost much of the kingdom's land to the Mughals, who were slowly encroaching due to his weak leadership. Eventually Empheror Jahangir attacked, capturing Bihar, Tripura and Manipur. Although ruling over very diminished lands, Lakshmi Narayan did manage to get certain agreements made with the Mughals in Delhi, and they allowed him to construct a new capital at Atharokotha village. From there, he established Vaishnavism as the imperial religion in his kingdom. In 1621 A.D., Lakshmi Narayan's son, Bir Narayan took over the rule of Kuch Bihar, and he was succeeded by Pran Narayan, who was Nara Narayan's great-grandson. It was on Pran Narayan's watch, in 1661 A.D. that the Mughals advanced their campaign into the heart of Kuch Bihar, under the leadership of Emperor Aurangzeb. Things had been relatively peaceful in the region from the time Lakshmi Narayan established his court at Atharokotha. But eventually a succession battle began between Aurangzeb and his brothers. Pran Narayan took this opportunity to invade Bengal, seizing Ghoraghat, which was the center of Mughal power in 1658. By 1661, Pran Narayan had captured Dhaka, the capital. By this time, however, Aurangzeb had consolidated his power, and sent armies to invade Bihar and Assam. Pran Narayan retreated to the mountains and continued to fight. During his reign he managed to rebuild several Vaisnava temples that had been destroyed by the Mughals, including the temples in Baneswar, Shandeswar and the Kamteswari temple at Gosanimari. He brought in architects from Delhi to finish the Jalpeshwar temple, but that work was not completed during his lifetime. His successor, Madan Narayan, completed construction of Jalpesh before his own death in 1680. This temple is still standing today. 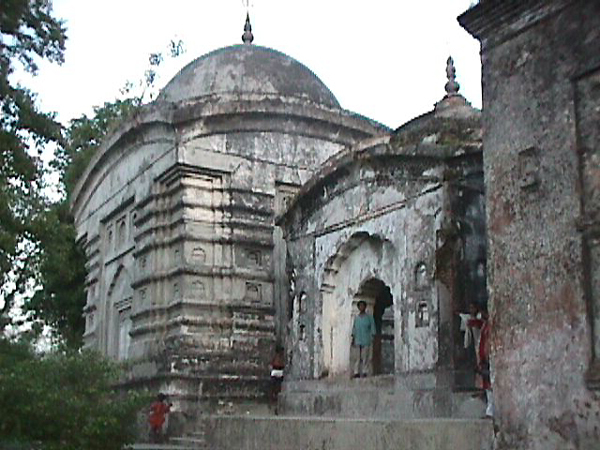 Kamteswari Temple, built by Pran Narayan, 1665 A.D.